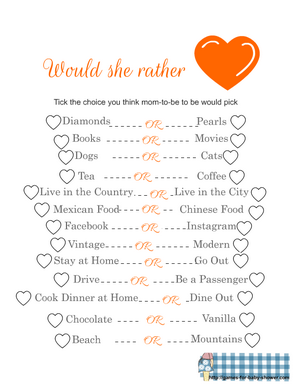 Would she Rather is a fun game with interesting questions about mom-to-be. Play this game to know if the guests really know the mom-to-be well and the choices that she would rather make. I have made Free Printable Would She Rather Game cards in three different color. You can print the blue one for boy baby shower, pink for girl baby shower and you can also print it in orange if parents to be do not know or do not want to reveal the gender of the baby. How to Play: Print and distribute these would she rather game cards among the guests and also give them something with which they can write. Give a game print out to mom-to-be as well. Ask the guests to guess the choices that mom-to-be would rather make. The person whose answers are closest to the ones given by the mom-to-be will be the winner. This is a free printable would she rather game card in blue color. This cute game is decorated with hearts. There is a big blue heart at the top as well. Just click on the thumbnail image of this game and a bigger image will open up that you can print. Click on the image given above to get the bigger version of this Pink would she rather game printable.